Wattleseed is a bush food that has been used by Aboriginal people for thousands of years, it contains 33% more protein than wheat. It's gluten-free and has a low glycemic index. 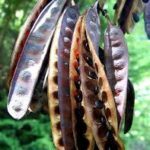 The bush tucker herb is good for you, it contains magnesium, zinc and calcium. 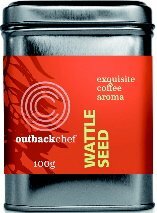 The coffee, chocolately flavours of wattleseed can be used in muffins, bread and great in ice-cream, use instead of coffee for a caffine free drink. Wattleseeds are the edible seeds from any of the 120 species of Australian Acacia that were traditionally used as food by Australian Aborigines and they were eaten either green (and cooked) or dried (and milled to a flour) to make a type of bush bread. Acacia seed flour has recently gained popularity in Australia due to its high nutritional content, hardiness, availability, and low toxicity. Due to its low glycemic index, it is also often incorporated intodiabetic foods. Vic Cherikoff (a significant pioneer in the Australian native food industry) developed Wattleseed as a flavouring in 1984 from selected species and this is now the major commercial product used because of its chocolate, coffee, hazelnut flavour profile. It is often added to ice cream, granola, chocolates and bread and widely used by chefs to enhance sauces and in whipped cream and other dairy desserts. Baron's Brewery in Sydney makes Wattle Seed Ale, a spiced ale that is lightly flavored with Wattleseed. Dogfish Head Brewery in Milton, DE also makes a beer called Urkontinent made with Wattle seed, among other interesting spices.